An Asura spy probe near our Solar System forces Mahabali to make an unscheduled visit to the Earth. As his spacecraft lands at a desolate dak bungalow in the Himalayas on Dussehra, the Indian defence establishment scampers to find out who the high-tech intruder is. "Looks like saving the Earth will be my first assignment," Mahabali tells the select group of immortals (chiranjeevis) as he will soon take over as the chief of the Devas at the end of the current era (Manvantara). Vyas agrees...but others don’t. So Vyas tells of the last time such an intergalactic joint operation took place 5,000 years ago. Sai R. Vaidyanathan is an author/journalist/columnist. 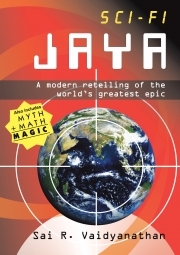 Besides Sci-fi Jaya, he has authored 'Chanakya’s last move', 'Gita: The complete argument', 'Who stopped Surya? ', 'Vedic Q&A', 'Happiness@WORK', 'Happiness@WORK 2', 'The Complete Happiness@WORK' and e-book 'The last Pandava'. He has also been a guest faculty member at Panjab University, Chandigarh. Besides writing on other subjects, his focus, for the past two decades, has been the Vedic civilisation.